Coveralls and overalls are types of personal protective equipment (PPE). 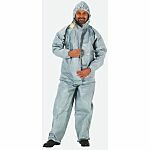 They offer a wide range of general and special purpose protective clothing that handle various hazardous tasks, including disposable overalls for processes. Overalls often have to compromise between comfort and protection, with disposable overalls being produced of polyethylene that offers a liquid barrier for protection against hazardous liquids as well as being breathable to keep the user comfortable. Various different jobs require different levels of protection, with many options available from reusable to disposable. This is based on the cleanliness standards and the difficulty of regular clean ups. Disposable overalls are lightweight and allow the user to comfortably be worn over regular clothing, but strong like cloth to resist tearing. Some overalls have further qualities are also fire resistant or impermeable for addressing specific types of hazards. Examples of these overalls in the industry is within a lab, with technicians and others who need to maintain sterile environments and protection from contaminants. You need to protect yourself from harmful substances, with disposable overalls are an economical alternative. When protection from dirt and contaminants is needed, fabric clothing may be the better choice due to stronger materials, longer lasting and savings from regular replacements. Protection of these overalls incorporates antimicrobial, fire resistant, chemical resistant and grease resistance. Both reusable and disposable overalls can have elasticated cuffs, ankles and hoods, protecting the wearer from splashes, drips and dust. In more hazardous environments, overalls are made from more durable materials protecting the wearer from chemicals, and can be flame retardant. European standards of overalls are segmented into types of protections, types relate to different groups of applications with similar characteristics. The types includes six types to cover all environments from Type 1 to type 6.